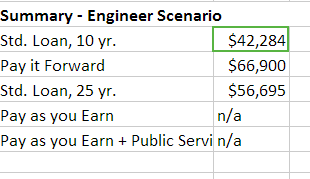 Yesterday I put together a spreadsheet and looked at two different approaches to income-based repayment — a current federal program (Pay-as-You-Earn) and Oregon’s proposed Pay it Forward. 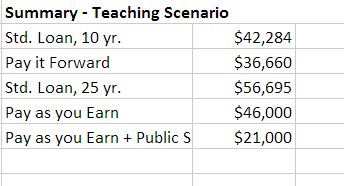 It did not end well for Pay-it-Forward, although I’m still waiting for someone more familiar with modeling these policies to pick up the torch and check/fix my models. 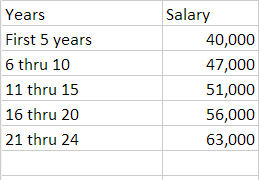 You’ll notice $30,000 a year is the break-even point for single people with no children. Below this Pay-as-You-Earn, with its progressive structure, handily outperforms Pay it Forward. 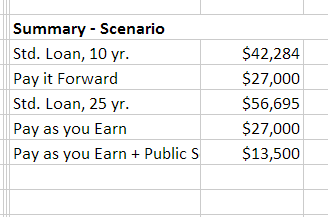 Above $30k/yr, Pay it Forward starts to provide a low lifetime cost to the loan. 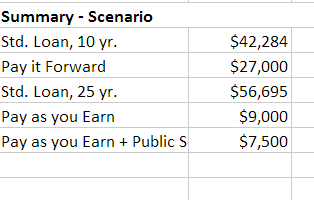 Because Pay-as-You-Earn is tied to discretionary income, and discretionary income is impacted by children, Pay-as-You Earn ends up a better deal here for single parents (I’m not modelling married parents because it’s a hassle to code the spreadsheet). How much does it impact it? So much that Pay-it-Forward becomes three times as expensive as Pay-as-You-Earn. Three times. So what ends up being the pivot point for the single parent? At what level of income does Pay it Forward become a better deal than Pay-as-You-Earn? 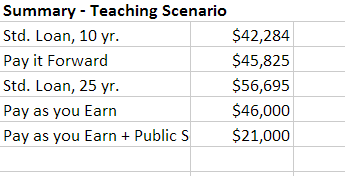 It’s actually $47k/yr. 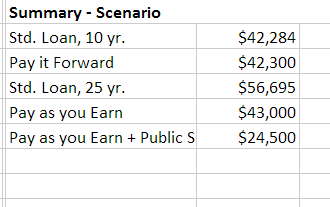 This means that people making a lifetime average of $47k/yr or less are better off going with the federal program if they are single parents. 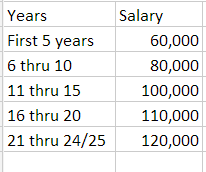 Interestingly, this is also the break-even point with lifetime cost of a standard loan (although again, the high payments on a 10 year plan are an issue here). Again, I want to stress this is a rough pass at these figures. Tweet these around if you must, but the point here is not to “win” the argument, but to convince people to start doing the math. I’ve just finished reading Susan Cain’s Quiet, which is a must-read for anyone in instructional design. (And by must-read I don’t mean you should read it because you will like it, but that you should read it because to not read it would be negligent: this book will open your eyes to an educational system increasingly demanding extroversion for success). There’s a lot of thoughts swirling around my head right now, but one of the more interesting ones is this: why have we wasted so much time talking about learning styles (which don’t seem to matter much in practice with success at classroom activity) and made so little time for talking about the introversion/extroversion spectrum of personality, which seems, in my experience at least, to matter quite a lot? I’m going to guess it’s because there’s money in coming up with Netflixy learning styles solutions, but there’s not much in deconstructing the assumptions inherent in group work. Other ideas? Thanks Giulia — I often speak in a shorthand about learning styles that doesn’t always capture the complexity of the issue (witness the amazingly convoluted sentence at about them in this post). I believe, in fact, that my position on the subject is somewhat closer to Kolb’s, who I seem to remember saying at one point that of course reading literature was going to require one set of preference-independent skills and doing math another. And that’s largely the rub — the impact of those authentic barriers tends to outweigh the impact of our arbitrary ones. That doesn’t mean that we should not address the arbitrary barriers, but that the way in which this has been presented and implemented has been just this side of astrology in many cases. The focus on “styles” trivializes deeper issues that students are having engaging with the course. We can’t deal with these issues without a fundamental rethink about what education is about. So I agree that what we really need when we look at both accessibility and these issues of introversion and “styles” is a universal design approach. And the issue becomes how we accommodate multiple routes to participation while both incorporating smart design based on research and while preventing the complete fracturing of the educational community we are attempting to build around a common experience. Online approaches, from the earliest Usenet groups to the latest cMOOC or ds106 experience, have some lessons for us there. And, admittedly, display some blind spots as well. I didn’t post my massive post on what universal access looks like on the intro/extro-version spectrum, but the upshot is that if you imagine a workplace that values the work of both introverts and extroverts that you can work back pretty directly to a model for teaching. I hope to cover that in a future, meatier post.